I’m an artist. It’s the one thing I know I can do. I feel truly blessed to have my talents and I believe it is my purpose to put it out into the world. Some people are doctors, philanthropists, public defenders, I draw pretty pictures. My hope is that my pretty pictures bring joy to people. I’m not curing diseases… but maybe I’m giving smiles. I’m always looking for new reference to expand my knowledge and I began looking at animals, endangered animals. This was my first in that series. 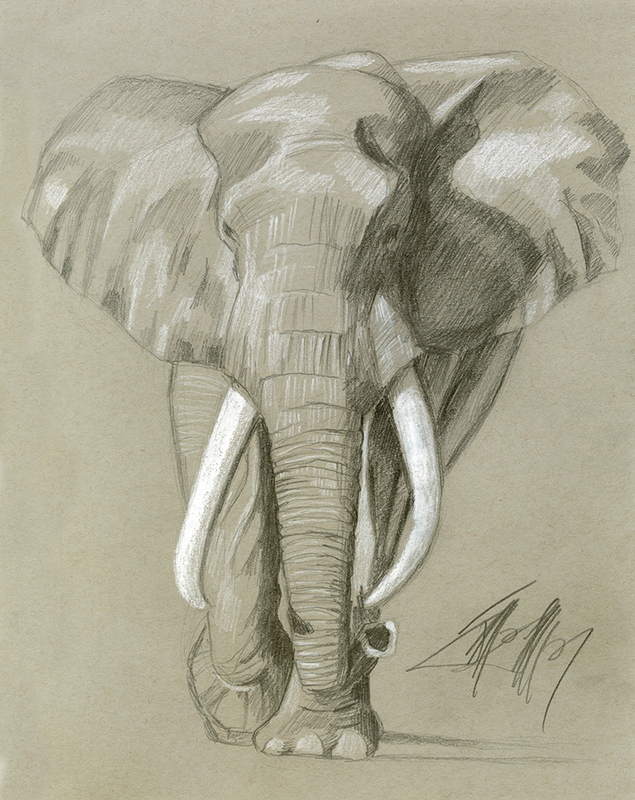 The African Elephant. Such beautiful creatures being poached for such a stupid reason. Upon completion, I immediately thought of the plight of these beautiful animals… so I thought I would use it to try and make a difference; An inexpensive way for you to help me through represent.com and the World Wildlife Federation. Click the image below to purchase one. I make nothing from this, all the profits will go directly to the World Wildlife Foundation. Click this image to go to the campaign site and purchase this shirt. Lovely shirt and lovely intention . . .